The Bahamas government is working to override economic and social challenges by reducing expenditure and raising revenue through a debt management reform strategy, Minister of State for Finance Michael Halkitis said in the House of Assembly March 4. State Minister for Finance Michael Halkitis details the government’s debt management reform strategy to redress high expenditure and low revenue economic challenges during the 2012-13 Mid-Year Budget debate in the House of Assembly March 4. (BIS Photo/Gena Gibbs). While the global economy slowly recovers, the Bahamas government is working to override economic and social challenges by reducing expenditure and raising revenue through a debt management reform strategy, said Minister of State for Finance Michael Halkitis in the House of Assembly March 4. The Minister gave details on policy measures and initiatives in the government’s fiscal strategy to move away from debt servicing and into growth. “Our government cannot and will not impose an additional tax burden on Bahamian families and businesses, which have lived through the most difficult economic recession in generations. Higher taxes, at this time, could also undermine the nascent economic recovery that is clearly underway. And let there be no doubt, the economy is advancing, modestly though steadily, from the shadows of the global recession,” he said. 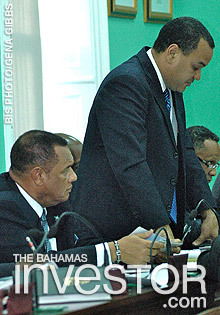 Halkitis outlined the 2012-13 Mid-Year Budget that was presented to the House by Prime Minister and Minister of Finance Perry Christie on February 27. “The true hallmark of the statement is the presentation, in clear and straight-forward terms, of a detailed medium-term fiscal consolidation plan that is designed to restore our public finances to a healthier state. I would suggest that the elaboration of such a plan represents a landmark achievement in that the government has now set out, for all Bahamians to see in clear and simple terms, a blueprint for the evolution of the key components of the government’s fiscal structure over the next four fiscal years,” said Halkitis. The Minister said renewed vigour and expansion in the tourism sector, as well as ongoing activity in construction, have been the principal engines of economic revival. He said tourism has benefitted from a rebound in air arrivals, which were up by over six per cent during 2012, building on the growth of almost five per cent in 2011. He said that the construction sector is growing, based on foreign investment projects in the tourism sector throughout The Bahamas, which would expand the tourism product to offer more rooms and facilities to bolster the growth of the Bahamian economy. “Growth in domestic economic activity is projected to be sustained in 2013, with the IMF projecting somewhat stronger real growth in the area of 2.7 per cent. This sustained, though moderate, expansion stems from continued global growth, particularly in the United States. This should spur further gains in the high value-added group segment of the tourist market,” said the State Minister. He added that ongoing large-scale foreign investment developments and, to a lesser extent, public sector programmes are expected to sustain the growth in construction. He said the IMF forecasts ongoing steady economic growth in real terms at rates similar to that of 2013 due to the creation of 2,000 jobs and a decrease in the number of discouraged workers, making Bahamians more optimistic. He said that while that is encouraging, it is clear that the government can do much better than that by stimulating the economy to achieve appreciably higher rates of growth over time in order to generate sufficient new job opportunities to reduce unemployment. The Minister said that the government will strive to foster enhanced linkages between sectors and identify and remove impediments to growth, particularly in the business environment. The government, he added, has attached a high priority to identifying, promoting and supporting new foreign direct investment (FDI) projects, particularly in Grand Bahama and the Family Islands, as well as reviewing developments in Bimini, Abaco, Eleuthera, Cat Island and San Salvador. Finally, Halkitis said that the government proposes a National Training Agency to properly equip future generations with the requisite skills sets and create an environment that will provide them with gainful employment opportunities. He said that small and medium sized enterprises are the real engines of growth and job creation, which requires the government to develop a new policy framework. Almost four years to the day after the Dow made its ultimate financial crisis low, the stock market officially posts a new all-time record high–a rather remarkable feat considering where both the market and the economy were not so long ago. For some perspective, this chart illustrates the trend of the non-inflation-adjusted Dow from 1990 to the present.